Start capacitors are used on compressors where system designs require high starting torque. 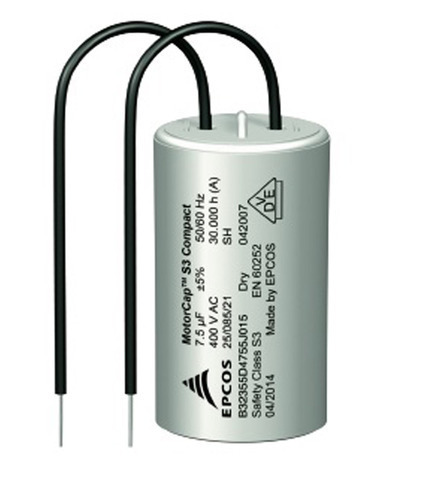 Epcos start capacitors has a construction of Dielectric: polypropylene film, Plastic can and top UL 94 V2 material and Dry type capacitor. They have Low dissipation factor and provide self-healing properties too. We, Rishabh Enterprises, incepted in the year 1993, at Chennai (Tamil Nadu, India), are a reliable Manufacturer, Importer, Trader and Exporter of a wide assortment of Flaring Tools, Filter Driers, Refrigerator Stabilizer, PUF Insulation Panel, Hi Flow Tank Pump and much more. As a reputed company, we manufacture our products using the high-grade raw material as per the set industry norms. Our exporting country is Germany, Thailand, Europe and China. We import our product from Thailand. We use advanced technology and high-tech machinery to manufacture these products. Our team of experts examines the raw material thoroughly, before using it in the manufacturing process. Our offered range of products is widely demanded across various industries due to their dimensional accuracy, robust construction, perfect finish, high performance, longer service life and Reliability. These products are duly tested on set quality parameters to ensure their flawlessness. Further, these products can be customized as per the precise requirement of clients at competitive prices.